The RV lifestyle lends itself to being nomadic as we travel from place to place – but there comes a time for most of us when we think, “I’d like to find lovely spot and just stay there for months!” You want a place that you can call home whilst out on the road; somewhere to just stop for a while and take it all in. There’s also a growing trend for RVers to travel to a specific location annually and catch up with fellow travellers that are like an extended family. Whatever your reason might be, if you’re savvy about the location and do your homework, there’s money to be saved by staying put for weeks on end. These days, most caravan parks accommodate long-term stays. If you’ve previously found a top spot in a park and aim to return, book well in advance to secure your booking and your site number. This is a must if you’re travelling in a convoy and would like 3 or 4 adjacent sites. It’s not surprising that popular locations have loyal visitors that book 12 months or more in advance to secure that perfect site. Some parks offer long-term stays at discount rates. These parks have designated “semi-permanent” areas. The cost of staying can vary between parks and is generally based on length of stay and the type of set up you have. Electricity is sometimes on a separate meter. Do your preparation and know exactly what you’re after. That way you have a better chance of negotiating a mutually satisfactory fee for a longer stay. Many farmers are diversifying their properties to embrace tourism as a means of expanding their income. Farm stays have grown in popularity and vary in what they offer and how they operate. Some allow you to camp and expect you be entirely self-sufficient, whereas others offer camping and basic amenities. It’s also not uncommon for a range of tours to be available. The opportunity for travellers to work at some of these farm stays is also a drawcard. In return for work, travellers can take advantage of free site accommodation and amenities, and power or Internet access might also be included. If this type of employment appeals to you, ensure you clearly understand the requirements and conditions. With the popularity of happy hours, it’s no surprise that many enduring friendships grow out of this long-standing tradition. An invitation is often extended to ‘come and stay if you’re ever in our area!” along with email addresses and phone numbers. At times, this is accompanied by the words: “Stay as long as you like!” – often from those who have an acreage or a small property. This can be great fun and will certainly help eke out the dollars for the period of your stay. If you accept, make sure you’re the ideal guest! By far the most popular style of long term camping is completely free campsites. They’re everywhere! You just need to know where to look or who to ask. And even better, they’re a perfect way to stretch your holiday budget further! As this type is the most popular, we’ll spend some time covering a day in the life of a long-term free camp. 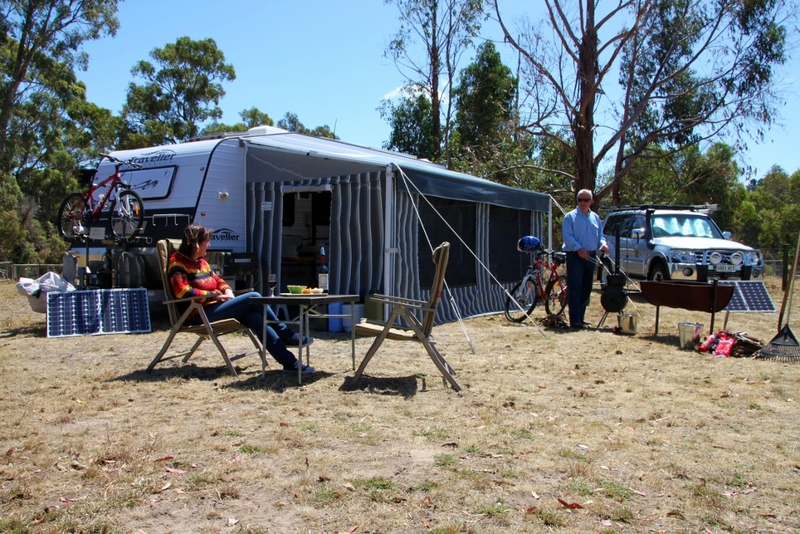 The travel plans of many RVers include a mix of days in free camps and caravan parks. These overnight stays are a great way to keep your accommodation costs down. Generally, most RVs can easily stay unplugged for one or two nights before needing to refresh, recharge, and replenish. But how many travelling nomads can really say they’re equipped to be off the grid for weeks or months on end? Location – Is phone coverage available? Will you be camping close to water? Can you have a fire, and if so, are there any restrictions? Water – We can’t live without it! Calculate how much you need, and where you can get it when you run out. Water is a major factor in determining your length of stay. Food – We all have to eat, but how much do you need? What types of food work for long term stays? Do you need to cook, heat, or refrigerate? The answers to these questions will determine the equipment you’ll need. The RV lifestyle provides great flexibility as long as you’re carrying the right stuff. The question is how long it will last and whether you have the right equipment and supplies for a long-term camping experience! For those who would like to be off the grid for a month or more, we’ll look at some basic items you should be carrying. Water. Everyone has different needs, so work out how much water you will be using on a daily basis. Calculate your average daily use in two categories: drinking/cooking and the rest, which will encompass bathing, general washing, and occasional clothes washing. Divide these answers by your on-board storage/carrying capacity to give you the maximum time you can stay (unless you have a method of collecting water from somewhere). Food. This comes down to personal choice. You can carry a range of food that doesn’t require refrigeration, such as food supplied in pre-packed sealed bags. Other options include canned products and dry ingredients that can be baked into tasty meals. Use a daily meal planner so you can calculate the right quantity of food for the number of days you’ll be staying. You will need to consider storage methods and extra weight being carried. Food Storage. When you’re planning to stay for some time, the less you need to rely on refrigeration the better. Foods designed for long-term storage are, naturally, ideal for this. You can vary your choices by using canned meals, vacuum-sealed products, dry packaged foods, and ingredients that can be cooked in camp ovens. Store leftovers in vacuum-sealed containers to increase their shelf life. A bit of time spent planning your meals is well worth it – you won’t have to pack up and move on because you’re starving! Power. It will come as no surprise to find that your power needs are determined by what you will be doing and what you will by using. If you need consistently run appliances that need 240v, then you’ll need a generator and fuel (provided there are no restrictions where you’re staying). Alternatives such as 12 volt power, batteries, solar panels, MPPT regulators, and DCDC chargers will go a long way to satisfying your needs. You will need to spend some time monitoring and calculating your power needs and usage, so it pays to have some on-board diagnostics – or at least a multimeter. Gas. Most RVs come with a gas supply of some sort; it’s the storage quantity that will vary. Gas is economical if it’s used wisely and can go a long way when used for cooking and heating water. If possible, use wood for a small campfire or combustion style cooker to extend your stay. Refrigeration. You need to keep things cool and cold, and this process uses a lot of energy if you’re relying on gas for a three-way fridge, or 12 volt for a compressor-style. You can increase the efficiency of your fridge by keeping it well packed, cool and well ventilated, and opening it as little as possible. You can reduce the energy draw by watching temps and adjusting thermostats overnight. Location and setup – Study the environment before unhitching and setting up. Know where the sun sets and rises because this could affect your solar. Lessen the risk of being caught in a flood by not parking in a valley or watercourse, and stay clear of large trees that can drop branches. Pests/Insects – Be on the lookout for ants, wasps, bees, and any other pests. Have a plan to manage them, or be prepared to relocate. Phone Service – Have a plan in place in case the campsite you choose is out of phone range. You may like to have a satellite phone for emergencies or consider GPS tracking satellite devices like SPOT for security. Road Closures – These can occur for a variety of reasons, but be sure your plans allow for unanticipated delays. Sit it out using emergency supplies – have some extra water and food with you. Camp Etiquette – Consider others. You won’t always be alone, since unplugged freedom camping is popular. Keep your rubbish in containers and dispose of it correctly – or better still, take it out with you. Offer to share communal fire pits. Keep noise to a minimum. Emergency Planning – Have multiple back up plans: you never know when they’ll be needed! Consider health issues and medications, and keep a well-stocked first aid kit. Daily Checks – Perform a daily check on all essentials like water and gas levels to ensure that things are going to plan. Also check that your vehicle will start and the battery is charged. Check the area around your RV by doing a quick walk around and keep your site clear and tidy. Enjoy your camp – The money you save from your first long-term stay will easily buy extra days the next time you visit a caravan park. 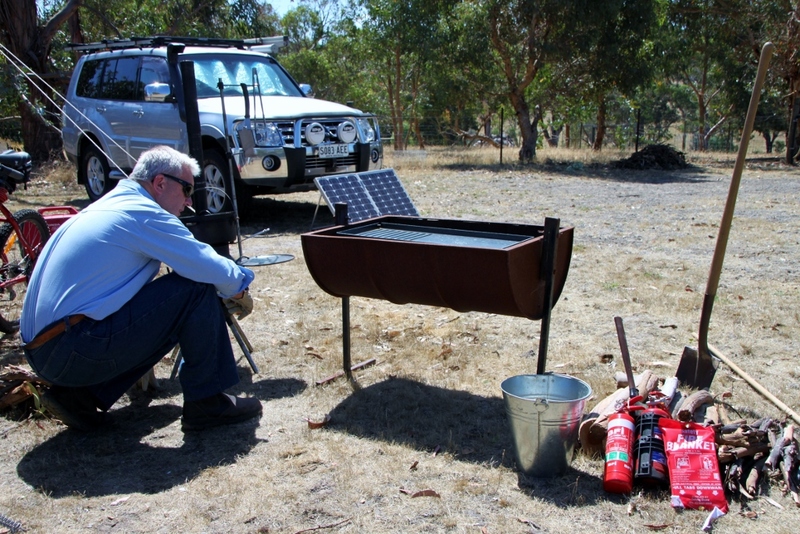 The costs for staying off the grid are not high – you may need an extra water tank or an extra gas bottle to stay a bit longer. When you schedule a longer stay on a powered site, the amount you will spend is often determined by the degree of comfort you want, or the popularity of a certain location. 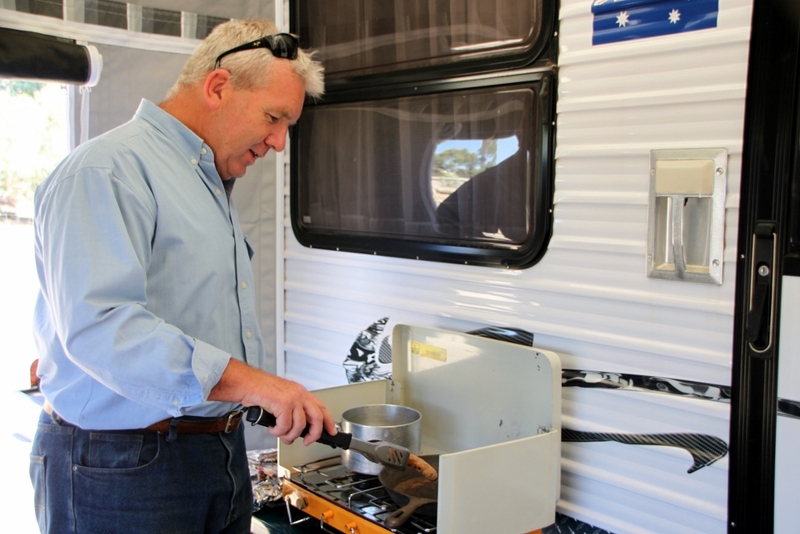 It’s not uncommon these days to be paying $30-$40 a night in a caravan park – which can be $900 – $1200 a month. No wonder free camping is growing in popularity! If there were 10 items we think every long-term camp can’t do without, these would be it! Lighting – Have a couple of torches on hand and close by with spare batteries, and a few candles in safe containers. Insect management – Keep insect sprays, powders, mozzie coils, and ointments in your kit. 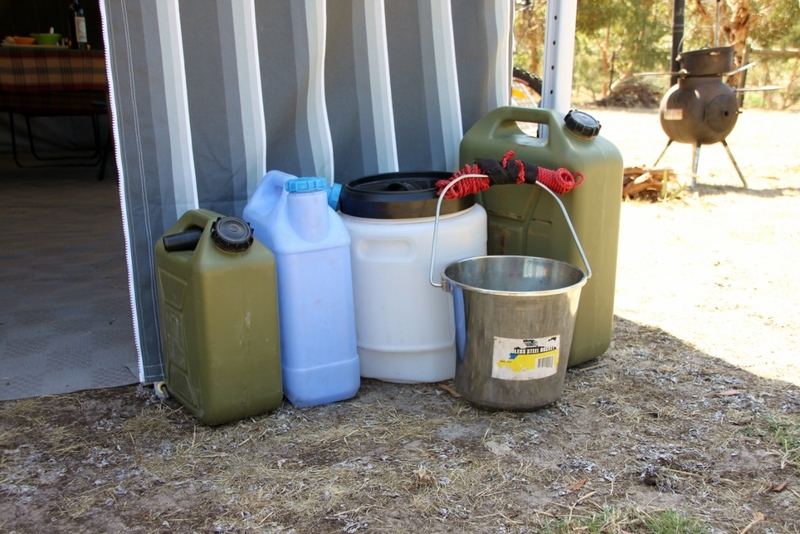 Water storage solutions – Use these to collect and transfer water: strong buckets, storage vessels with lids, jerry cans if you have them, plus a funnel for water transfer. Tap Fittings – Have a variety of different types of tap fittings and sizes to collect water on the way to your camp. Long Handle Shovel – Has multiple uses but particularly digging deep holes for disposal of organic waste products. Medication – Depends on personal circumstances but at least carry some pain management. Fire Starters – Includes matches or spark lighters for lighting gas burners and starting a small campfire. Waste Management solutions – cassette-style toilets and environmentally friendly rubbish bags. Fire Management – In-date fire extinguishers, fire blankets, rakes, and water buckets. But don’t forget your vehicle! Do a quick walk-around and visual check of your tow vehicle, caravan or motorhome. Battery maintenance is important – a daily run will help to keep things charged. Check for any insects that might want to make a home inside your rig. Use shade reflectors for all windows to keep the inside cool, especially if you have a fridge inside. Remove all droppings to protect the paintwork – use a car cover if you have one. Spend some time pre-planning. Staying in a remote location for weeks on end doesn’t mean you need expensive and fully kitted-out off-road caravans. All you really need is a good plan. See you out there!